As gay couples begin to marry in New York, Third Way's newest report details the seismic shift in our country since the passage of DOMA 15 years ago. There are many striking contrasts that illustrate this evolution, but one incredible change is this: in 1996 only 5% of the country lived in a state or locality that recognized gay couples' relationships--now 46% do. While 53% of the general public now supports marriage for gay couples, 59% of self-described Independents favor it, as do 65% of moderates. The number of states offering protections and benefits to gay state employees and their partners has jumped more than ten-fold, from 2 to 22. The number of people living in jurisdictions that provide legal recognition to gay couples has leapt more than ten-fold, from 13 million to 143 million. The number of Fortune 500 companies offering protections and benefits to gay employees and their partners has increased more than fifteen-fold, from 19 to 291 companies. 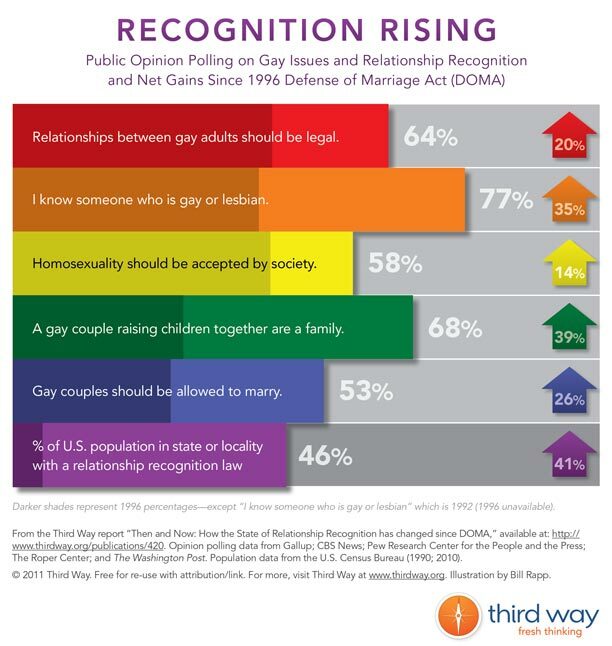 Check out the full report and infographic to see how far we've come since DOMA!